On Tuesday, June 5, HoMA was honored to welcome two special guests: His Imperial Highness, Crown Prince Akishino—second son of Japan’s Emperor Akihito—and his wife, Princess Kiko, for a private tour and luncheon in the museum Café. The royal couple’s four days in Honolulu comprised their first official visit to the United States, and was in honor of the 150th anniversary of gannenmono—the arrival of the first Japanese immigrants to Hawai‘i. “As stewards of one of the most significant holdings of Japanese culture outside of Japan, we understand and dedicate ourselves to the great responsibility of ensuring that we educate people from around the world about the art of Japan,” director Sean O’Harrow told the royal couple and their guests. Accompanied by Mayor Kirk Caldwell and his wife Donna Tanoue, the Prince and Princess visited two of our galleries, The Robert F. Lange Foundation Gallery and the John Dominis and Patches Damon Holt Gallery: The Arts of Hawai’i, where O’Harrow shared a few highlights from the museum’s collection. For the royal visit, a selection of ukiyo-e prints, including Katsushika Hokusai’s renowned The Great Wave Off Kanagawa, were brought out of the vault and displayed for that day only. 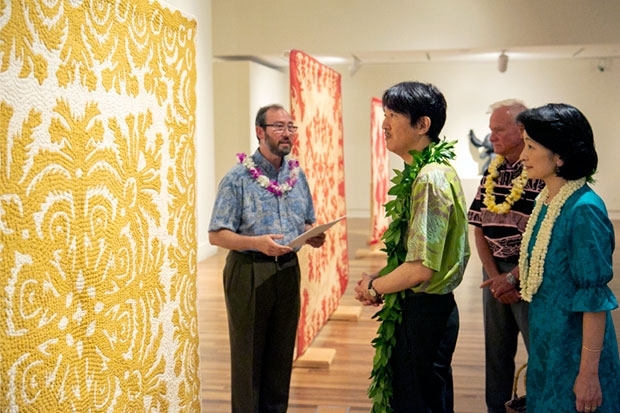 Since Her Imperial Highness is known to be fond of textiles, the museum’s textiles curator, Sara Oka, chose several antique Hawaiian quilts to showcase. 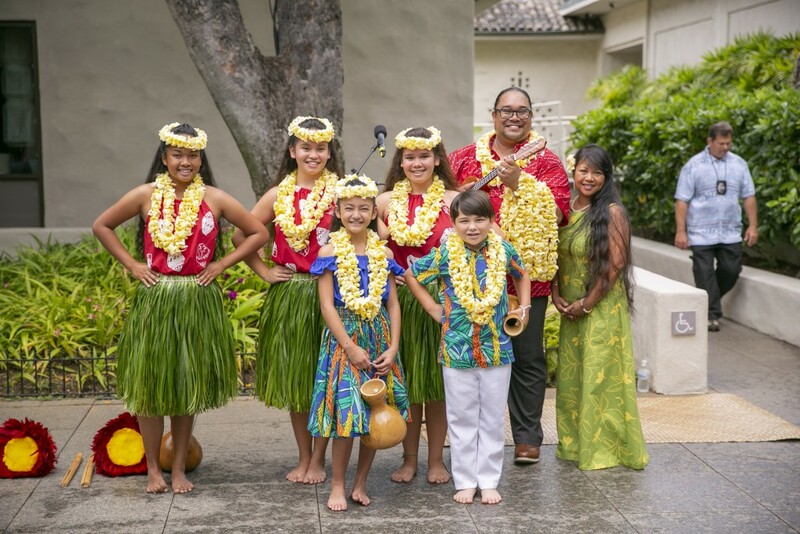 As the couple made their way to Luce Pavilion for lunch, they were greeted with a jubilant performance by dancers from Kumu Hula Nālani Keale and his Hālau Kaulakahi. Emcee Misty Kela’i welcomed the Prince and Princess to the Café, where they were fêted by an impressive gathering of Hawai‘i’s business and cultural leaders, including former Governor George Ariyoshi, City Councilmember Ann Kobayashi and museum trustees Taiji and Naoko Terasaki. Kumu Hula Nālani Keale and his Hālau Kaulakahi. Lunch was provided by the museum Café. After a spirited kampai (and okole maluna!) by Reverend and former Bishop Yoshiaki Fujitani and a blessing by Bishop Eric Matsumoto—both of Honpa Hongwanji Mission of Hawai‘i—the group enjoyed a deconstructed kukui nut and limu ahi poke bowl prepared by Chef Robert Paik. 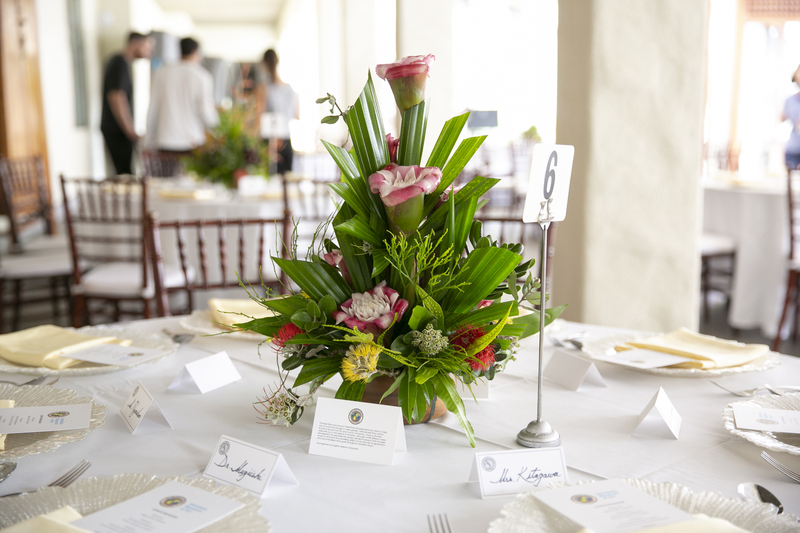 During a dessert of mango sorbet, the group was treated to a concert by members of the Hawai’i Youth Symphony Orchestra. 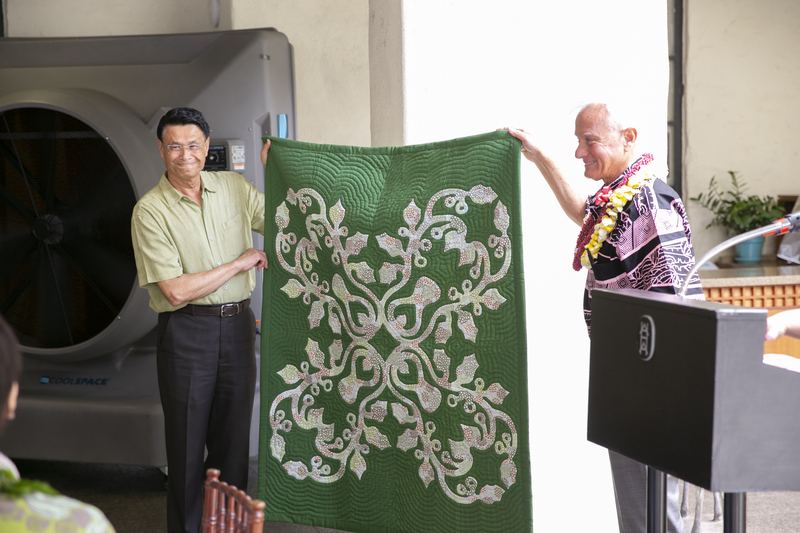 Afterwards, Mayor Caldwell stepped up to the podium to offer Princess Kiko a surprise gift—her own handmade Hawaiian quilt. The quilt gifted to Her Imperial Highness. “I want to thank Their Imperial Highnesses for visiting Hawai’i and helping us to celebrate this historic anniversary with pride and respect for our mutual shared culture,” O’Harrow said in his speech to the couple. Before departing to a tree-planting ceremony in Thomas Square, Prince Akishino addressed the group in English. With his maile lei fluttering in the breeze against his pale green Tutuvi aloha shirt, he acknowledged our historic new friendship, “Mahalo nui loa,” he said. What a delightful day for all who were there that day! Wish I could have been. The museum treated their special guests with the utmost courtesy. And what a lovely gift – a. hand made Hawaiian quilt. Hope the special guests get to return some day soon. What a wonderful reading of an auspicious occasion. I wonder, who crafted the handmade quilt? What a pleasure to have created something by hand to give to the royal couple, especially Princess Kiko. Mahalo!